I started training Karate when I was 10 years old. My parents found an ad in the local newspaper and I was hooked from the first training session. At the time the Sensei’s I trained with believed you should break down the students and start training the ones who got back up. In hindsight it was probably not the best teaching method but at least it taught us discipline and perseverance. As I grew up, I moved around a lot and every time I arrived at a new place, I tried to find some similarity and therefore a local dojo. This gave me the opportunity to try Taekwondo, Kendo, Aikido, self-defence for women and Boxing. 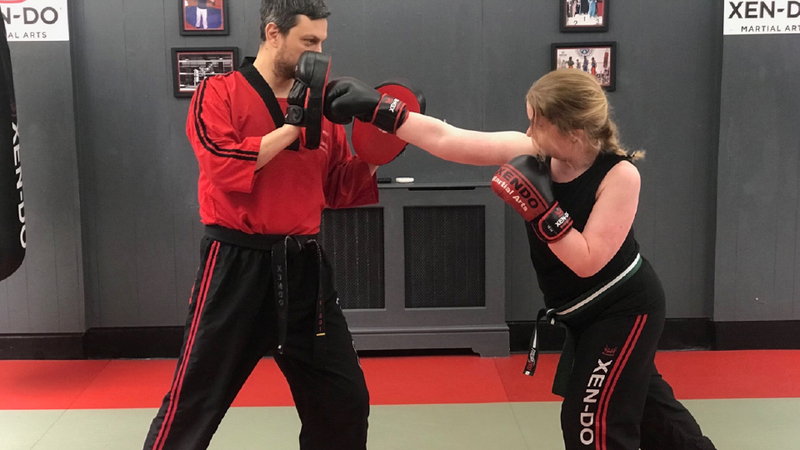 When I moved to London in December 2018, I googled the closest martial arts school and the first result was Xen-Do at the Seymour Leisure Centre. I booked my first personal introduction with Sensei Paul in January. After 45 minutes I was so tired we had to end the class, and I was questioning what I’ve gotten myself into. None of my previous experience had prepared me for the training I have undergone these past 9 weeks. I got to know Sensei Walter, who is more than happy to hit you with a pad if you stop doing mountain climbers, but he also knows how to put a smile on your face or give you a hug if you need it. Sensei Judah and Sensei Joe have a way of pushing your buttons by either scaring you or just making you push yourself far beyond any limit you thought possible. Then we have Sensei Paul, who has the ability to (within minutes) read you like an open book and make you open up in ways you never had the courage to do before. During my time at Xen-Do in Marylebone, I have met people from all corners of the world and learned that it doesn’t matter where you’re from or what background you have, nothing is like the experience you get when you sign up here. Sometimes it feels like a lifetime ago I had my first introduction, I now train 6 days a week and sometimes even two classes a day, but I always smile on my way to class and always have a smile on my face when I leave. The Sensei’s have an amazing way of making you feel like you belong as well as genuinely cared for and that they and the dojo are a home away from home.